Another interesting news of this week is here that the Chinese phone maker company Oppo has announced a discount for its three smart phones. The smart phones are "Oppo Joy", "Oppo Neo 5", and "Oppo 5S". This brand is not much popular in Pakistani market but price down is always said welcome by Pakistani users. Huawei, a popular firm, also announces price cut for "Honor 3C" and "P8 Lite". Here we have given you a table in which old prices have also been written with the new prices. So you can make a decision before purchasing a new handset by viewing the following table. Oppo Joy brought a price cut worth of 1,500 PKR and its new price is very reasonable. This is very primary type of phone which does not offer you so much stuff . Oppo Neo 5 presents a price cut worth of 3,000 PKR and whereas the Oppo S5 also offers same worth of price concession. 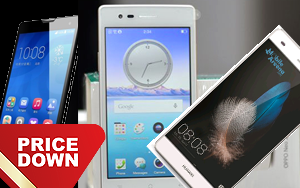 Huawei Honer 3C got only 1,000 price cut whereas Huawei P8 Lite is giving you a price cut about worth of 2,000 PKR.